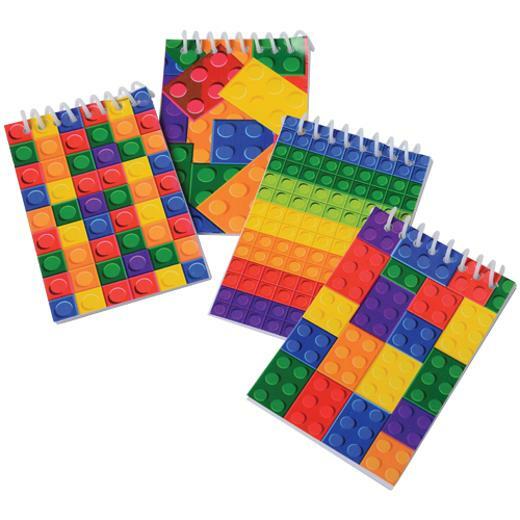 Cheap Block Mania Notebooks - 12 Ct.
Block Mania Notebooks - 12 Ct.
Includes 20 unlined pages - great for writing and drawing! Perfect party favor for any Block Mania themed event! Candy Notebooks - 12 Ct.
Block Mania Pencils - 12 Ct. Whether they are taking notes or planning their next LEGO design, your little master builders will love these Block Mania notebooks! Modeled after their favorite toy, the cover has the familiar brick building patterns kids love with 20 pages of unlined paper for writing and drawing. The perfect party favor to "build" a fantastic Block Mania event! L: 5.95 in. W: 1.0 in. H: 6.35 in.